What makes a good foam helmet and what are its advantages? Foam helmets are similar to cycling helmets in terms of construction and are specially adapted to the specific requirements of sport climbing. 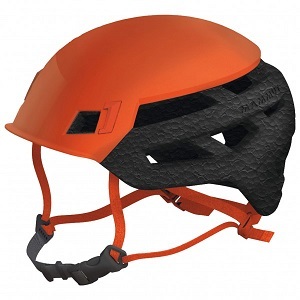 The shell of a climbing helmet is made of polystyrene hard foam and coated with a protective plastic layer. Foam helmets are extremely lightweight and stand out for their high level of comfort. Thanks to their light weight they are barely noticeable when climbing. If a collision or a fall occurs, the helmet deforms in a similar manner to the crumple zone in a car and absorbs the energy from the impact. For anyone who cares for optimal protection and high wear comfort during climbing, a foam helmet will always be the perfect choice.